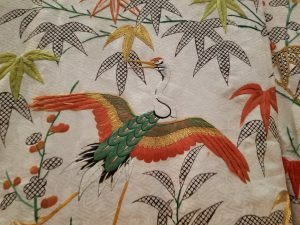 Last month, I taught in the Fort Worth area of TX and was fortunately to be able to visit the Kimbell Art Museum where there was a special exhibit, Lands of Asia, featuring items from the Sam and Myrna Myers Collection. 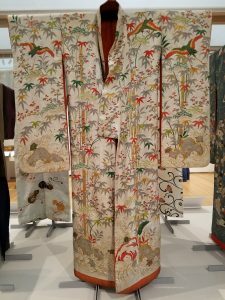 Most of these sumptuous silk kimonos were made for use in the Japanese theater from the early 1600’s to late 1800’s. 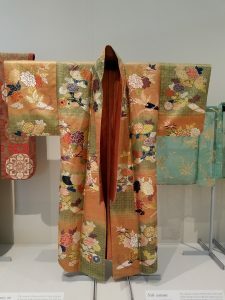 The kimono has been worn by both women and men in Japan since the sixteenth century. 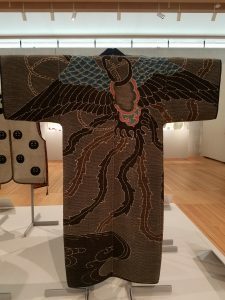 The T-shape is made from four strips of fabric folded in half and sewn together to form the sleeves and body of a robe that opens in the front. It makes an ideal garment for embellishment with elaborate decorative motifs. 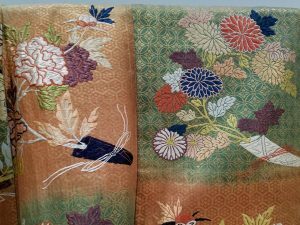 The weavers in Kyoto produced large quantities of brocade with colorful designs and gold and silver thread. Much of it went to the Noh theater where masked actors performed rituals and dance of scenes of mysterious tales to melancholic music. 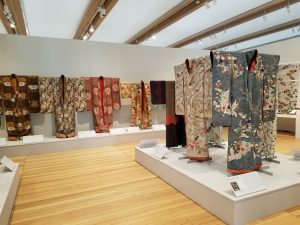 The costumes replaced the stage decoration and needed to evoke the condition and moral qualities of the characters by their colors and their motifs. They are stunningly beautiful with both woven and embroidered designs. The picture on the right, immediately above, is an exception. This is a fireman’s coat which is reversible. 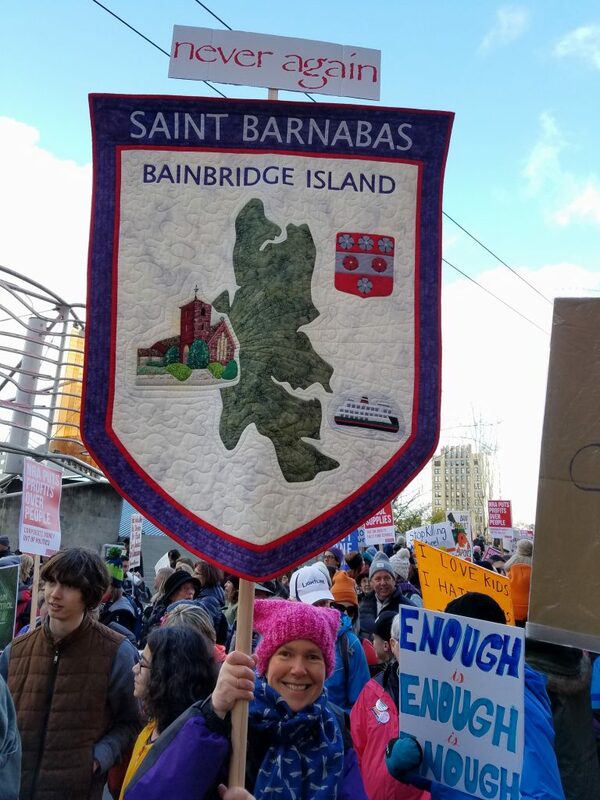 It is made rather like a quilt with layers of padded cotton (batting) between the outside and inside fabrics, all stitched (quilted) together. 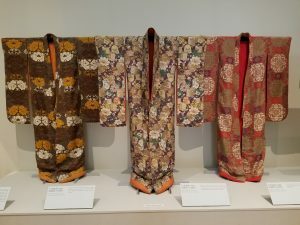 These thick kimonos were soaked in water when used in fire-fighting and would have been tremendously heavy when saturated.The design on it is a magic feathered cape, which flies in the sky above a stream like a phoenix. This image is drawn from mythology to evoke the notion of rebirth from the embers. 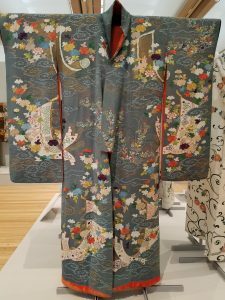 Last month, I taught in the Fort Worth area of TX and was fortunately to be able to visit the Kimbell Art Museum where there was a special exhibit, Lands of Asia, featuring items from the Sam and Myrna Myers Collection. 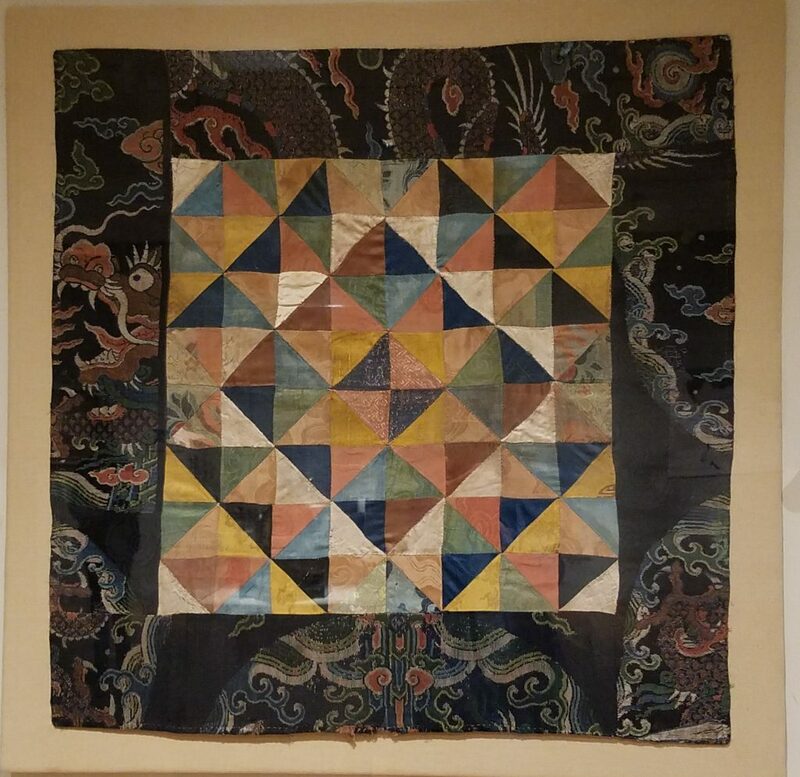 This silk Mandala from Tibet, Qing Dynasty (1644-1912), made from Chinese silk, caught my attention. The simple geometric pattern of triangles made from silk scraps glows and looks luminous. The large scale dragon print in the border is an added bonus. 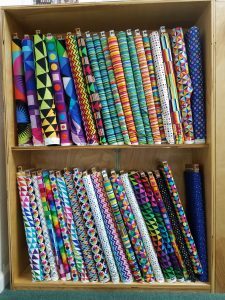 In Tibet, where imported silks were always in short supply, the practice of making patchwork from silk scraps and recycled donations of clothing became a pious act born of necessity. These Mandalas made from half-square triangles, may have served as sacred diagrams to focus meditation. The number of pieces and their colors and arrangements were linked to numerology and divination. Mandalas were used by Tibetans in daily and religious life for altar coverings and table covers. In the context of Tantric Buddhism, geometric patchworks evoked the matrix of time and space in which the soul was caught in the web of existence. “Home” is a group exhibition featuring twenty-five artists from the Puget Sound Region. The exhibit is at the Bainbridge Island Museum of Art, where it will remain until June this year. The “Home” group exhibit was organized by a partnership between Olympic College, Bainbridge Island Museum of Art (BIMA) and Bainbridge Artisan Resource Network (BARN). On 26th March, I posted a picture of me standing beside my quilt, Trip Around the Garden, in the exhibition hall. 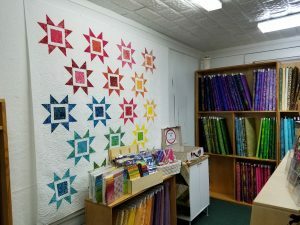 Last Saturday, I spent an afternoon there for a “Meet the Artist” event and noticed how the reflection of my quilt appeared in another artist’s work. We were delighted by this fusion of art! 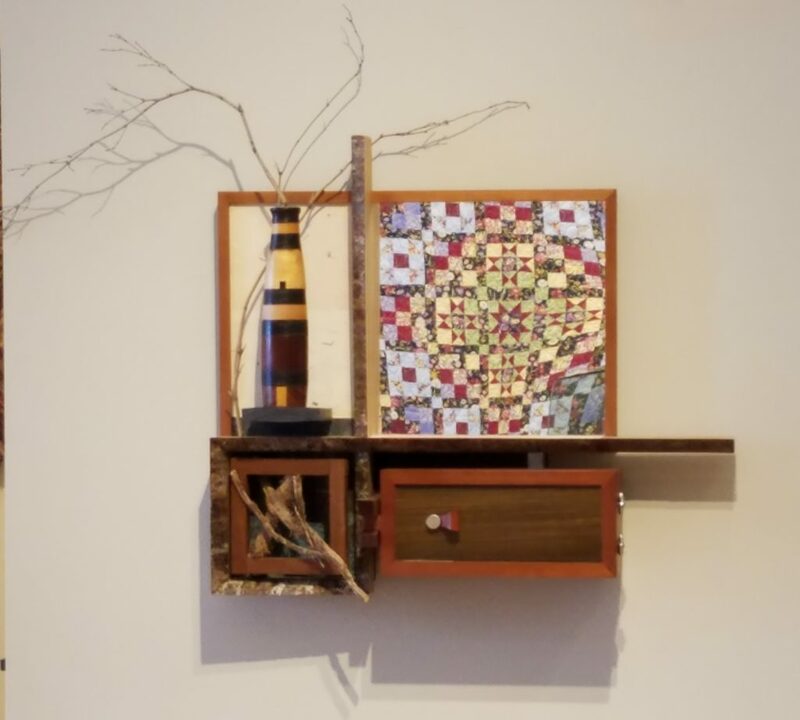 The center of my quilt is reflected in Matthew X. Curry’s piece, Valet 1, made from Argentinean lignum vitae, stack-laminate, branch, oxidized copper, wall-covering, leather and dried ivy root. The surface of the mirror isn’t quite flat in on the right side especially in the lower corner, so notice how the quilt becomes distorted in this section. Thank you Matthew, for permission to post this. 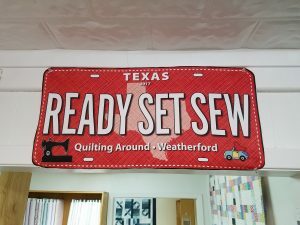 I recently taught at three quilt guilds in TX; Arlington Quilters’ Guild, Trinity Valley Quilters’ Guild in Fort Worth, and Quilters’ Guild of Parker County in Weatherford. 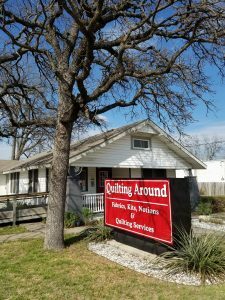 I visited Quilting Around, the quilt store in Weatherford. 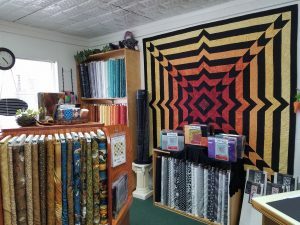 The store has a wide selection of fabrics and some beautiful patterns designed by Will Simpson. 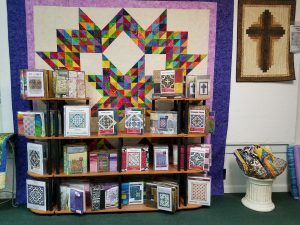 They are known for their block of the month patterns and for pattern kits. Here’s a little visual tour of the store. 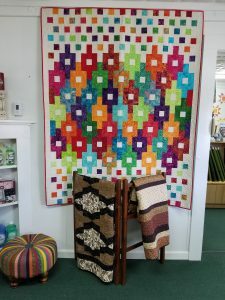 They sometimes have quilts for sale and they also collect quilts for donations to local charities. 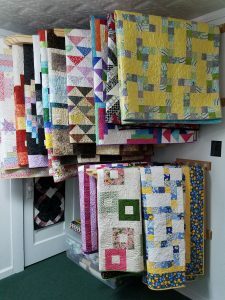 One of the photos shows some of these quilts. It’s worth a visit if you are in the area.